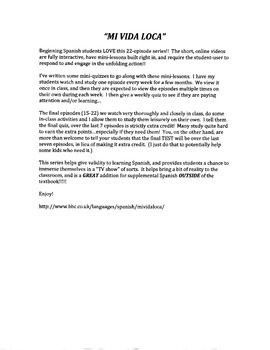 Beginning Spanish students LOVE this 22-episode series!! The short, online videos are fully interactive, have mini-lessons built right in, and require the student-user to respond to and engage in the unfolding action!! I have written some mini-quizzes to go along with these mini-lessons. I have my students watch and study one episode every week for a few months. We view it once in class, and then they are expected to view the episodes multiple times on their own during each week. I then give a weekly quiz to see if they are paying attention and/or learning some new vocabulary and phrases. 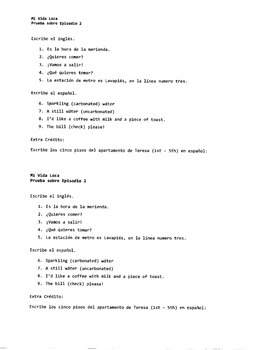 Episodes 1-14 have quiz items that are Spanish-English translations, English-Spanish phrases, and I've often included cultural questions relating to the individual episodes. This series helps give validity to learning Spanish, and provides students a chance to immerse themselves in a TV show (of sorts). It helps bring a bit of reality to the classroom, and is a GREAT addition for supplemental Spanish OUTSIDE of the textbook!!!! !